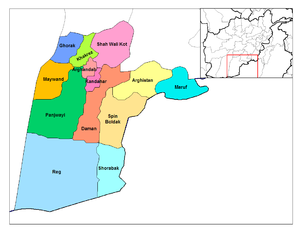 Kandahar or Qandahar (Pashto: کندھار or قندهار‎) (Persie: قندهار‎) is ane o the lairgest o the thirty-fower provinces o Afghanistan. It is locatit in soothren Afghanistan, atween Helmand, Oruzgan an Zabul provinces. Its caipital is the ceety o Kandahar, which is locatit on the Arghandab River. The province haes a population o nearly 913,000, wi ower 800,000 livin in its caipital ceety. The main inhabitants o Kandahar province are the Pashtuns. There is speculation aboot the oreegin o the name "Kandahar". It is believed that Kandahar bears Alexander's name, an derives frae the Pashto renderin o Iskandariya or Alexandria. A temple tae the deifee'd Alexander as well as an inscription in Greek an Aramaic bi the emperor Ashoka, who lived a few decades later, hae been discovered in the auld citadel. Alternatively, it is believed that "Kandahar" mey derive its name frae Gandhara, an auncient kinrick alang the modren Kashmir an Afghanistan border, and former satrapy of the Persian Empire. It is suggestit that fowk o Gandhara migratit sooth tae Arachosia an transferred the name wi them. ↑ Bosworth, C.E. (1999). "Kandahār". Encyclopaedia of Islam (CD-ROM Edition v. 1.0 ed.). Leiden, The Netherlands: Koninklijke Brill NV. Wikimedia Commons haes media relatit tae Kandahar Province. This page wis last eeditit on 25 August 2014, at 16:39.